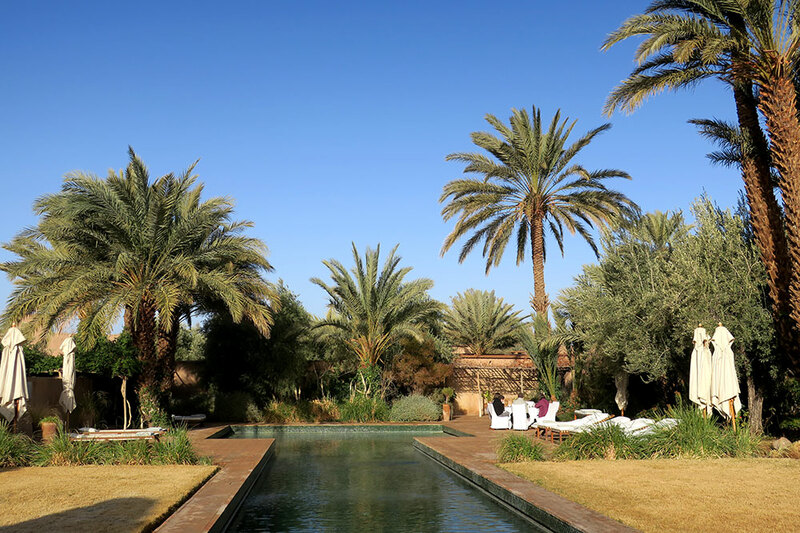 Although the high-season crowds in Marrakech can be overwhelming, a drive through scenic and unspoiled countryside soon brings you to abandoned kasbahs (citadels) and crumbling mud-walled ksour (fortified villages; “ksar” is the singular) undiscovered by tourists. 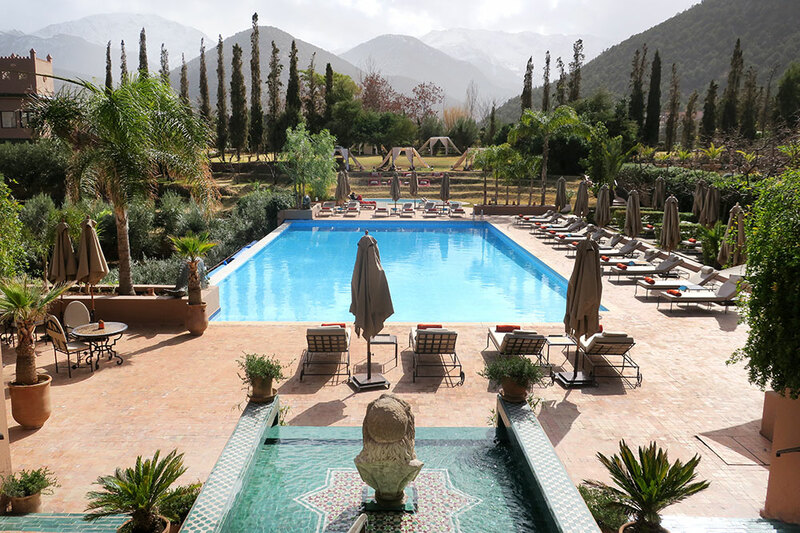 In the course of a week, we moved from Marrakech to the alpine grandeur of the High Atlas Mountains, continued to a palm-filled valley and concluded our trip in the sand sea of the Sahara. The journey through ever-changing landscapes had an epic, cinematic sweep to it. From Marrakech, our driver took us south across the Kik Plateau to the Asni valley, cutting through the foothills of the mountains. 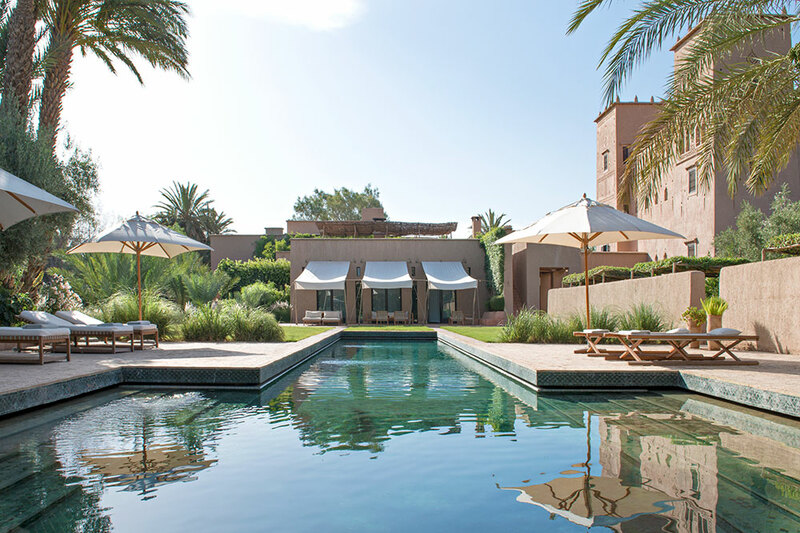 Around a bend in the road, we saw the distant crenellations of a castle: Kasbah Tamadot. On arrival, we passed through a garden courtyard to reception, where we were given cool, scented towels. Instead of checking in, however, we were taken to a patio overlooking a swimming pool backed by a line of cypress trees and Atlas peaks. 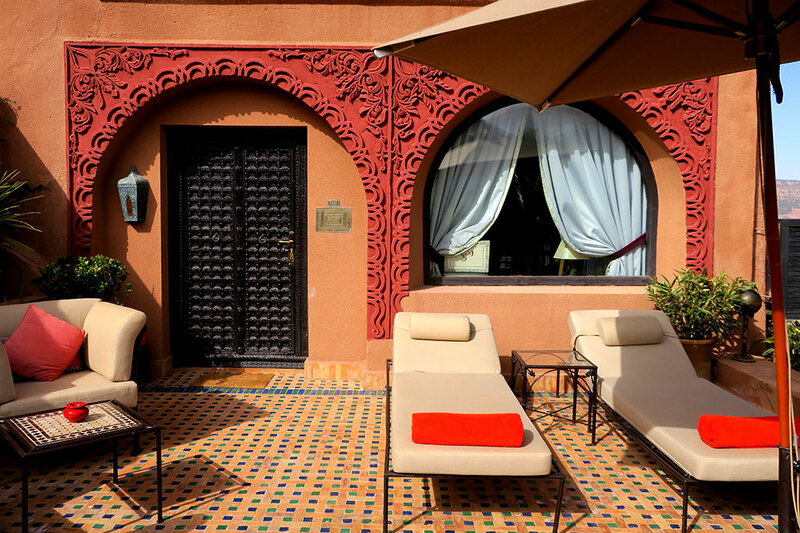 There we reclined in armchairs, sipping welcome flutes of Moroccan sparkling wine. 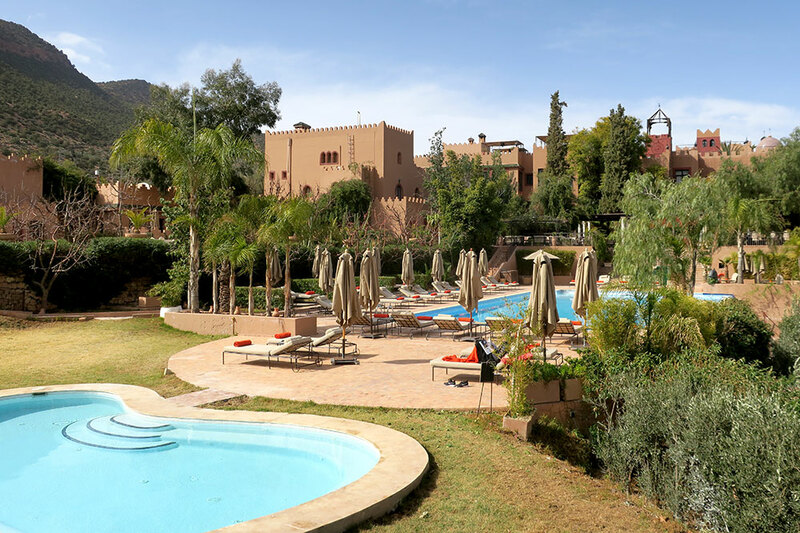 I had the feeling that our stay at Kasbah Tamadot would be all too short. This feeling was confirmed when we entered our Deluxe Suite, which had a strong sense of place. 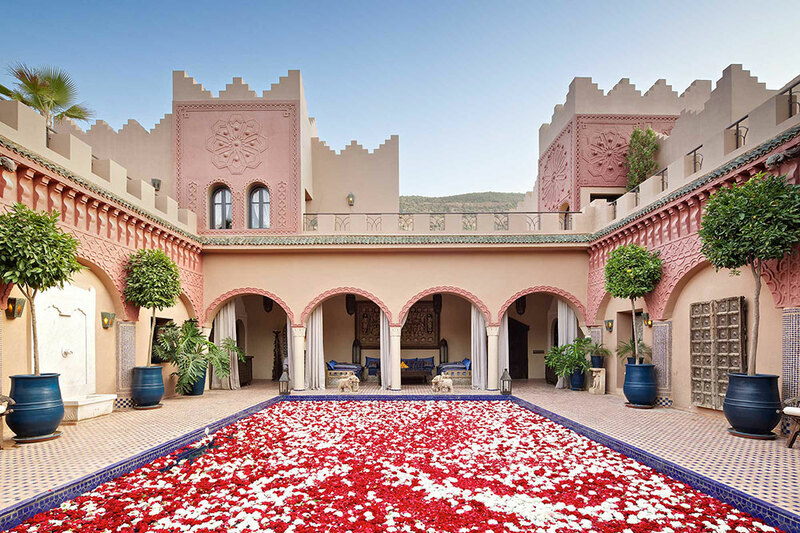 Pea-green walls, terra-cotta floors and a fuchsia velvet seating group were augmented by repurposed architectural elements, such as carved-wood arches with muqarnas (honeycomb coffers), doors inlaid with mother-of-pearl and a hand-painted geometric ceiling over the rose petal-topped king bed. The tub and separate shower were backed by red-and-white zellij tiles. 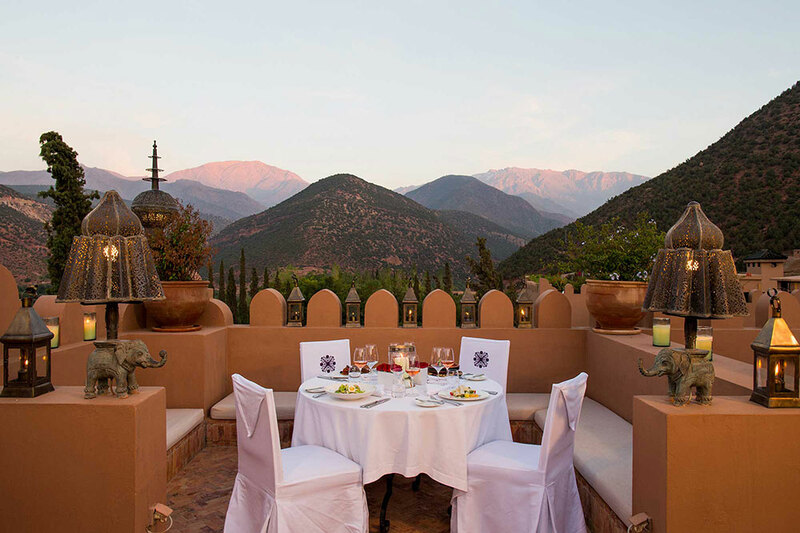 The loungers on our patio afforded views of mountains, the valley and the attractive village of Tansrat. Following lunch on the scenic dining terrace, I could have opted for a guided hike, but rain clouds had gathered, and the ornate library-lounge seemed far more inviting. After relaxing by the fire with my novel for a while, I wandered through the reflecting-pool courtyard. There I found a distinguished-looking man in a red fez, surrounded by the ingredients for mint tea. 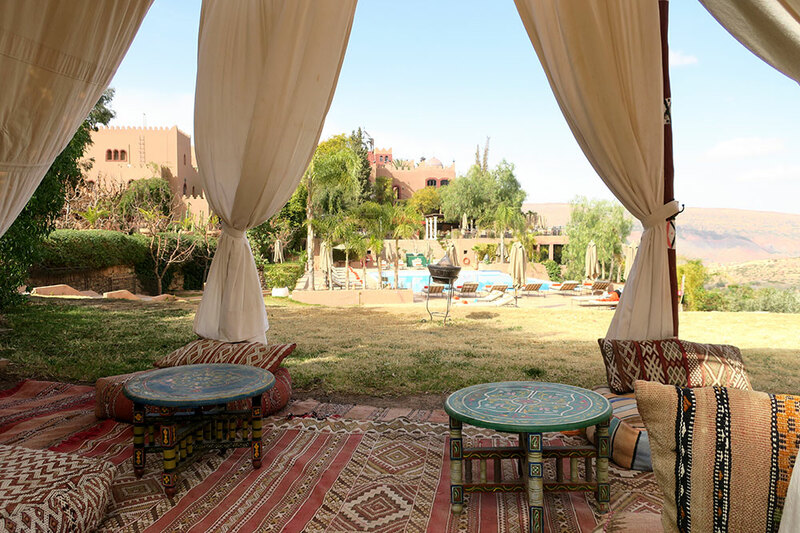 I sat on a leather pouf and struck up a pleasant conversation with Mohammed, Kasbah Tamadot’s tea master, while he prepared the perfect glass. Eventually I excused myself in order to see how my spouse was faring in the spa. Although attractive overall, this facility lacks changing rooms (which means that in winter guests must walk to the spa in nothing but their robes and babouche slippers), and the heated indoor pool has a tile-printed vinyl liner rather than actual tiles. Fortunately, the treatments were delightful. After aperitifs in the library-lounge, we headed to dinner at Kanoun Restaurant. The pretty candlelit space came with a colorfully tiled floor and brass chandeliers. The food was delicious. I started with pearl-shaped pasta in a light cream sauce with spinach, tomato bisque foam and sautéed prawns, followed by sea scallops with cauliflower purée and lemon. And I couldn’t resist some apricot cake, a specialty of the region, topped with pumpkin coulis and cinnamon ice cream. Later that evening, we chatted with a British couple in the tent-roofed Asmoun Lounge. 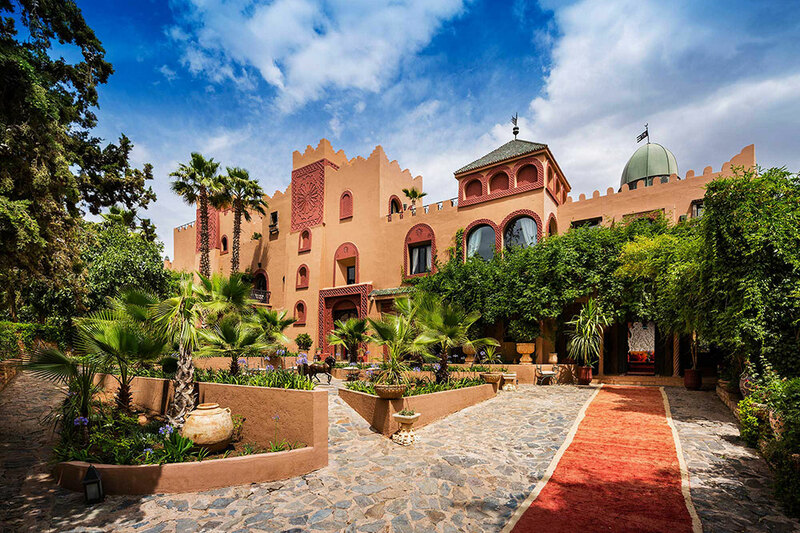 I envied the fact that they were staying for a week, but for most American travelers, two or three nights at Kasbah Tamadot will probably suffice. Having departed with reluctance, we wound our way east, up to the 7,415-foot Tizi n’Tichka pass. Our driver navigated the serpentine mountain road expertly while we enjoyed the splendid alpine scenery. On the far side of the Atlas Mountains, the landscape returned to otherworldly rock desert. The extraordinarily scenic setting; the glamorous pool; the chic accommodations with a sense of place; the cozy lounges with fireplaces. The spa’s lack of changing rooms; the high price. The main outdoor pool is unheated, but the spa’s indoor pool is comfortable for swimming year-round, and there is a large outdoor hot tub. Near Ouarzazate (Morocco’s film capital), we detoured to the astonishing ksar of Ait Ben Haddou, huddled against a riverside mesa. The site is no secret, but it merits a visit nonetheless. From there, it was a little over an hour to Skoura in the Dadès Valley. An ancient caravan stop, Skoura has a small, modern center surrounded by innumerable mud-walled kasbahs, their crumbling towers rising above the palms and olive groves. 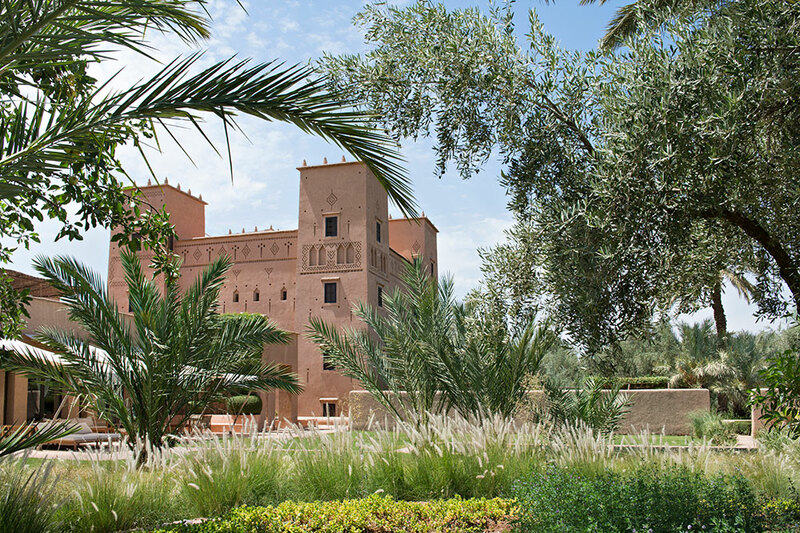 One of these has been carefully refurbished into a wonderful 14-suite hotel called Dar Ahlam. A member of the staff escorted us through the original dark, twisting main entrance hallway. Fragrant and candlelit, it felt wonderfully mysterious. 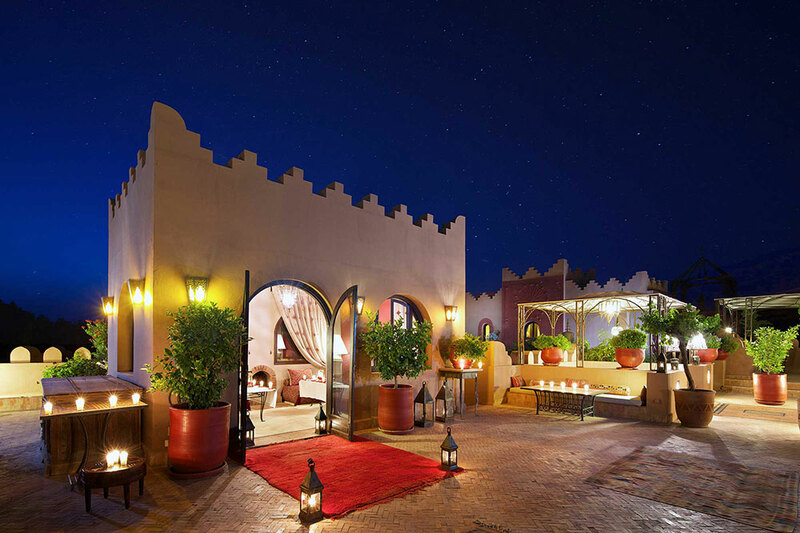 We passed through the light well at the center of the kasbah and came to a stylish, contemporary main lounge, where we settled with a welcome glass of wine by the fire. The original building contains two floors of Junior Suites. 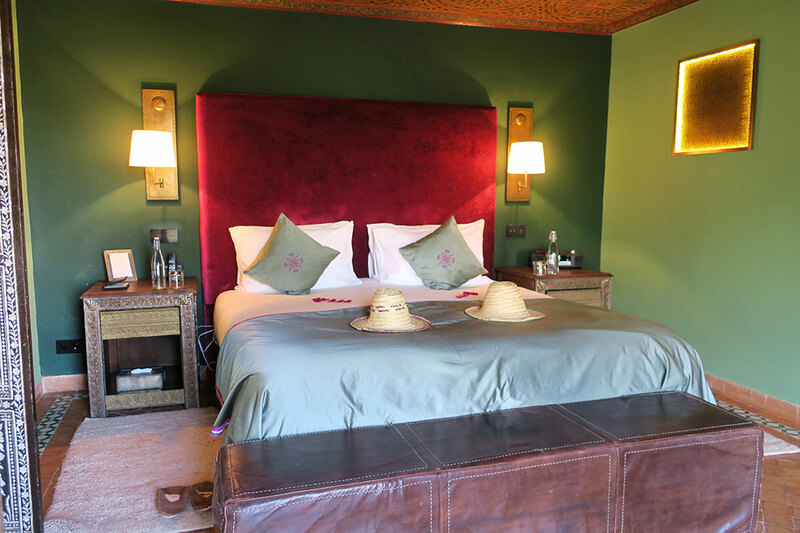 However, we were upgraded to a larger Superior Suite, in a new building located a two-minute walk away through a garden of olive trees and Mediterranean herbs. 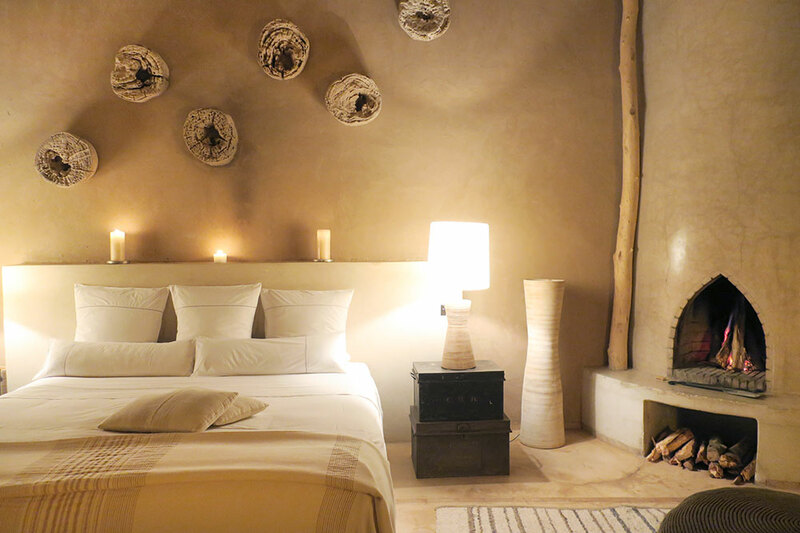 Our accommodations had smooth rammed-earth walls and a woodburning fireplace. The décor was attractively simple and appropriate to the destination, with weathered ends of old log beams mounted above the king bed, wicker chairs with beige cushions, a gray-and-white Berber rug and an oversize black-and-white photo of a local musician. A dark-wood library with a daybed niche divided the bedroom from the immense bath. The latter was centerpieced by a soaking tub beneath a window-pierced dome, similar to those commonly found atop traditional hammams. 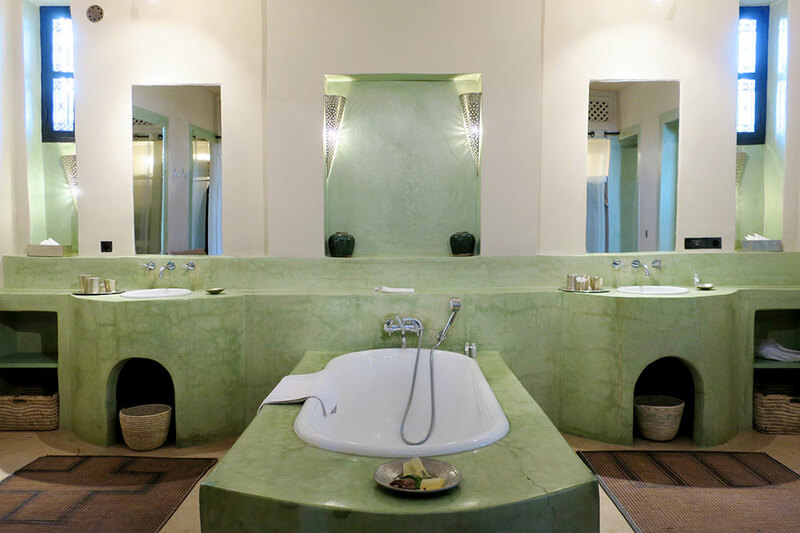 Two sinks were set in a green tadelakt (polished waterproof plaster) counter, while another room held a large walk-in shower. Dar Ahlam has no main restaurant, and we never dined in the same place twice. Lavish breakfasts might be in the main lounge if weather is chilly or by the inviting T-shaped swimming pool in more-clement conditions. 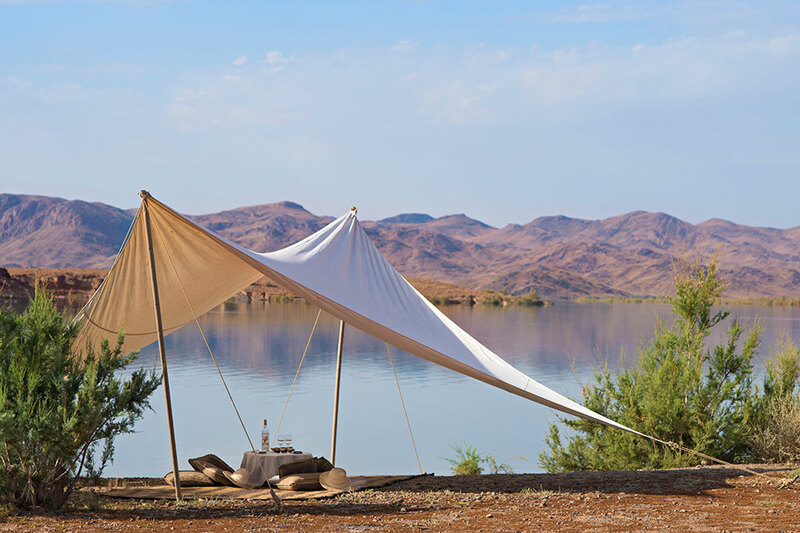 A lunch could be had on the hotel’s roof terrace or a picnic beneath a tent in a nearby river gorge. Our favorite dinner took place in a private lounge, illuminated only by candles and warmed by bronze tripod braziers filled with glowing coals. There we dined on chicken-filled warqa (a phyllo-like dough) pockets, lamb couscous, and a salad of orange and carrot topped with cardamom ice cream. Two musicians accompanied our meal, playing the violin and the oud (lute). 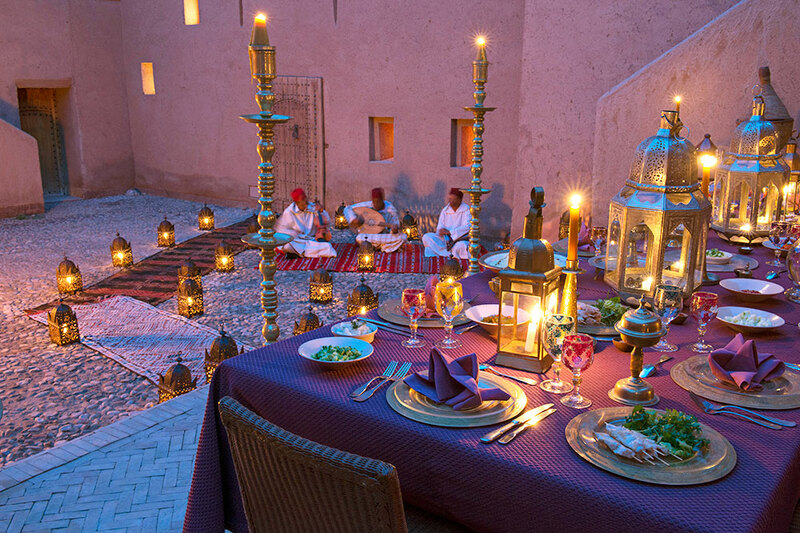 The memorable experience was an entirely convincing reenactment of traditional life in the kasbah. Service at the resort was consistently attentive and gracious, which is no surprise considering the unusually high staff-to-guest ratio. Our first evening, one man noticed that my shoes were muddy and offered to bring me some slippers while he cleaned them off. And someone was always on hand to offer a drink or a snack. Only the spa proved disappointing. 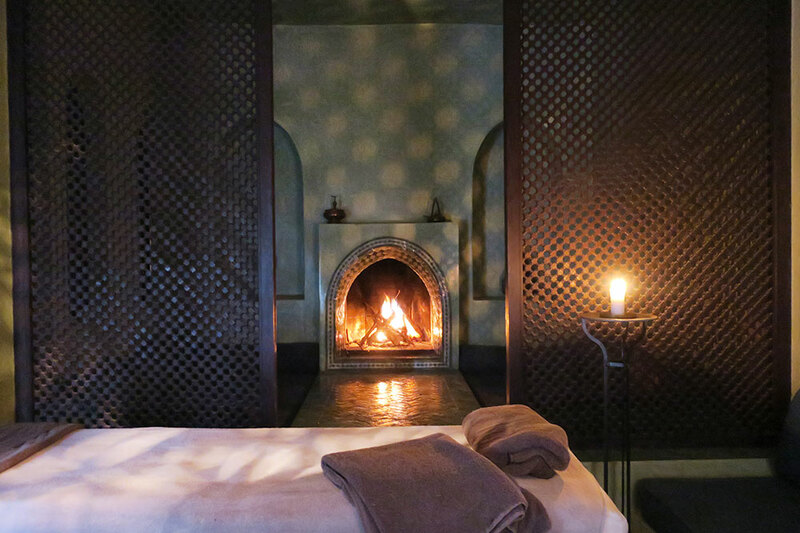 There were no disposable shorts to wear during the hammam treatment, and the steam room was barely warm enough to be comfortable, let alone sweat-inducing. The table for my subsequent massage had a fireplace nearby, but it lacked a face cradle, preventing me from relaxing my neck. One sensational excursion with a driver and guide included visits to the ruins of several kasbahs in Skoura, caves used by nomadic herders in a rocky Martian desert and a sublime river gorge picnic. 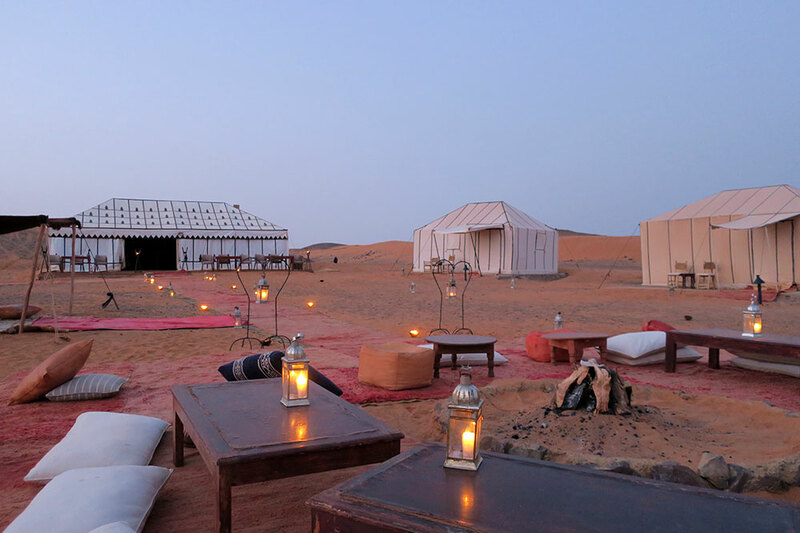 In the cool shade of a tent, we sipped our choice of wines while two waiters served artichoke barigoule with fennel and coriander seed, medium-rare beef brochettes, mixed vegetables in a saffron broth, and orange-spiked crème caramel. 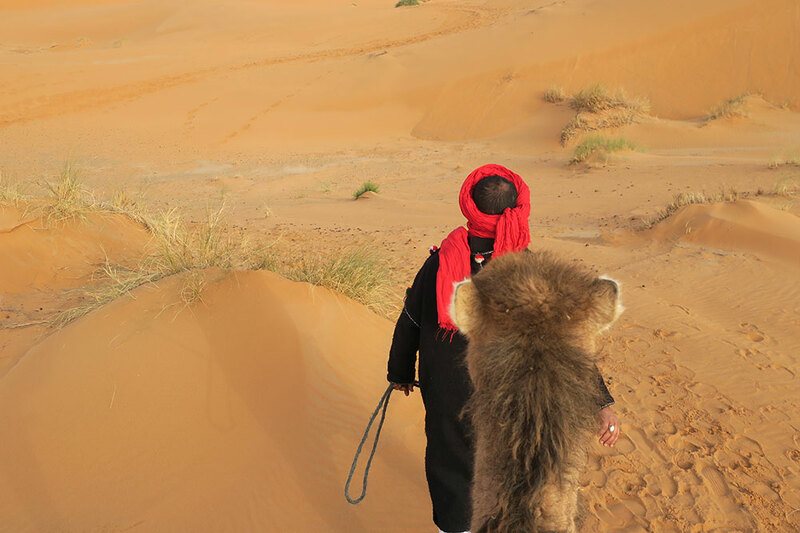 We bade farewell to Dar Ahlam and left with a driver organized by Merzouga Luxury Desert Camps. The transfer took almost six hours, passing through the M’Goun Valley, famous for its roses, and curving around the ksar of Tinerhir. After stopping to walk through the touristy but magnificent Todra Gorge, we then crossed the Anti-Atlas Mountains, where only the road and a few ruined kasbahs interrupted the bleak, alien landscape. Finally, massive sand dunes appeared on the horizon, dwarfing the low skyline of the town of Merzouga, like great red waves approaching the shore. 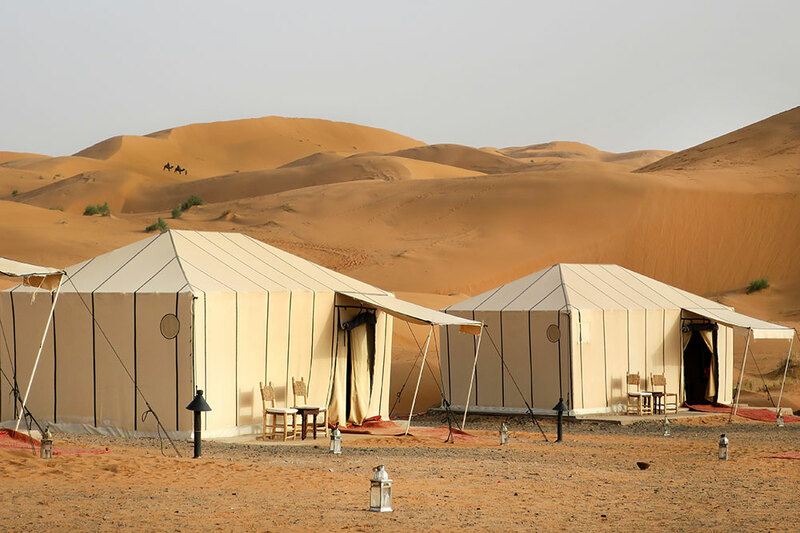 After 10 minutes of winding along an unmarked desert track, we arrived at a camp of 15 white canvas tents. This was a surprise, as I had reserved accommodations in the more expensive five-tent Private Luxury Camp. The staff seemed equally taken aback. Apparently, the Private Luxury Camp had suffered water damage (of all things) during a recent rain. After a lengthy phone call to the head office, they offered to adjust our bill. Our compact but well-appointed tent had a wood floor, running water and a shower. (Staff warmed the water with a woodburning heater.) It had no storage space to speak of, with only a wood chest on which to set our bags, but our one-night stay required little unpacking. With sunset approaching, we met our friendly camel wrangler, Mohammed, a Berber who grew up as a nomad in the desert. 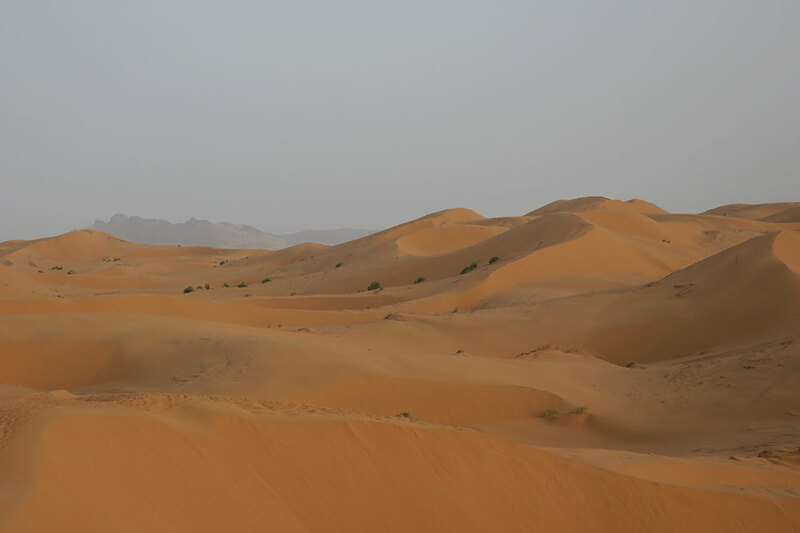 He led us on a 15-minute ride to the top of a nearby dune, where we had a view of the Sahara in all directions. 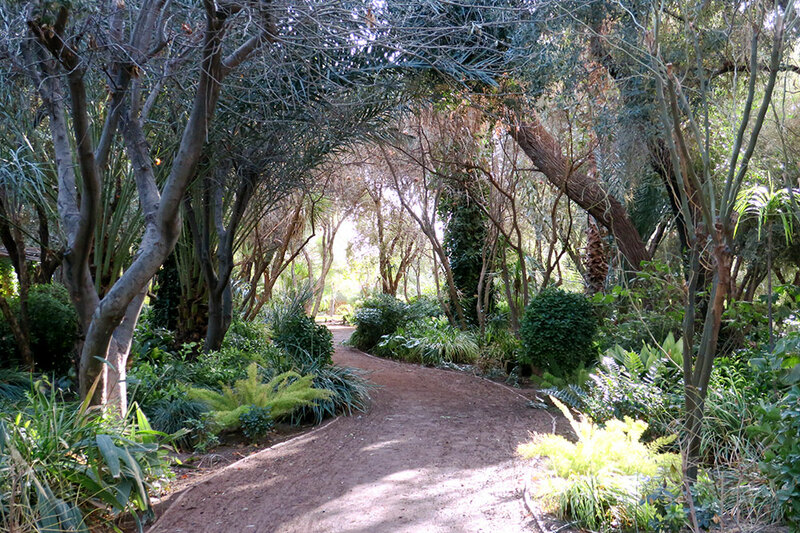 Even here, shrubs eked out an existence; indeed, they looked radiantly green in the wake of the recent rain. 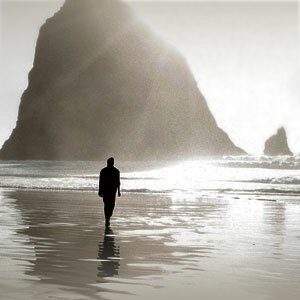 Otherwise, all was sand and silence. Dust in the atmosphere made the sun look wan and gray as it set, adding a melancholy quality to a landscape that was already strange and unearthly. We saw no spectacular reds or purples, but the experience was breathtaking nevertheless. After a simple but satisfying dinner in the main tent of lentil soup with hominy, vegetarian pastas, vegetable and beef tagines, and orange-flower panna cotta, four of the staff began drumming and singing. When they had finished, we wandered outside to marvel at the Milky Way until a cold wind drove us back indoors. Our tent had no heater, but the bed was covered by two duvets, and hot-water bottles provided additional warmth, allowing us to sleep in comfort. Checkout proved awkward, because the camp had no capacity to accept credit cards. Hence, it was a mystery why I had not been charged the full amount, rather than just a deposit. As our driver took us back to Ouarzazate, the camp’s office called three or four times to sort out the payment situation. Unable to accept a credit card number over the phone, the office eventually sent a representative to meet us at our hotel. He arrived, inconveniently, as we were about to sit down to dinner and explained that he hoped I would be able to pay in cash. Why he expected me to have hundreds of spare euros on hand was not made clear. 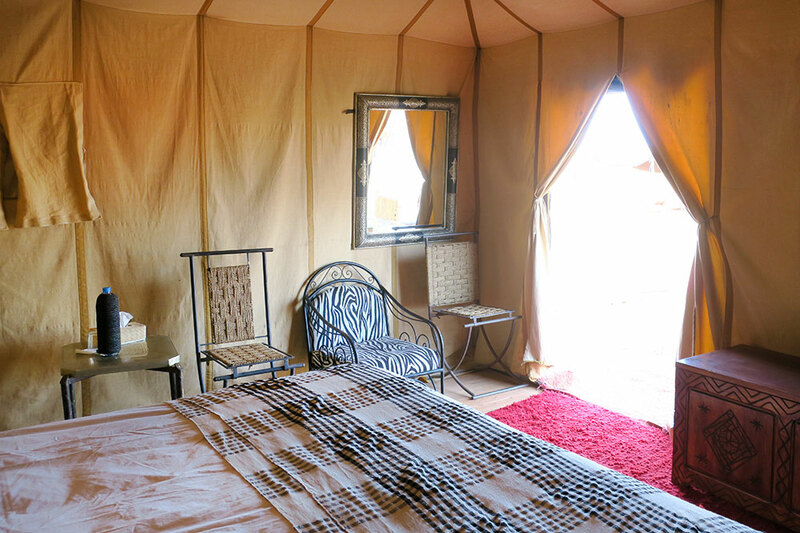 The Merzouga Luxury Desert Camps experience was memorable but not always for the right reasons. The office’s communication and organizational skills were as poor as any I’ve encountered in recent years. Instead, I recommend organizing a desert overnight with Dar Ahlam or a trusted ground operator in the region, such as Heritage Tours. Fortunately, the inconvenience was relatively short-lived. 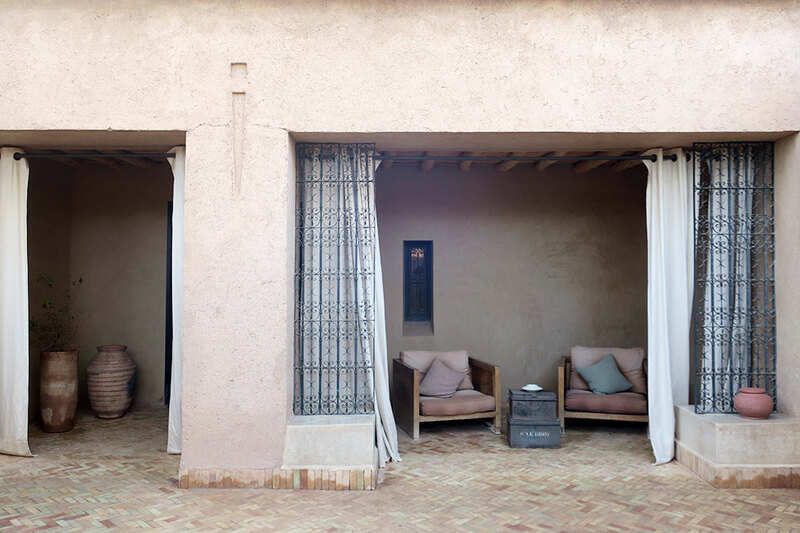 With the payment completed, we settled into the cushions around our fireside table and sipped some crisp and fruity Moroccan rosé, and once again, all seemed right with the world. 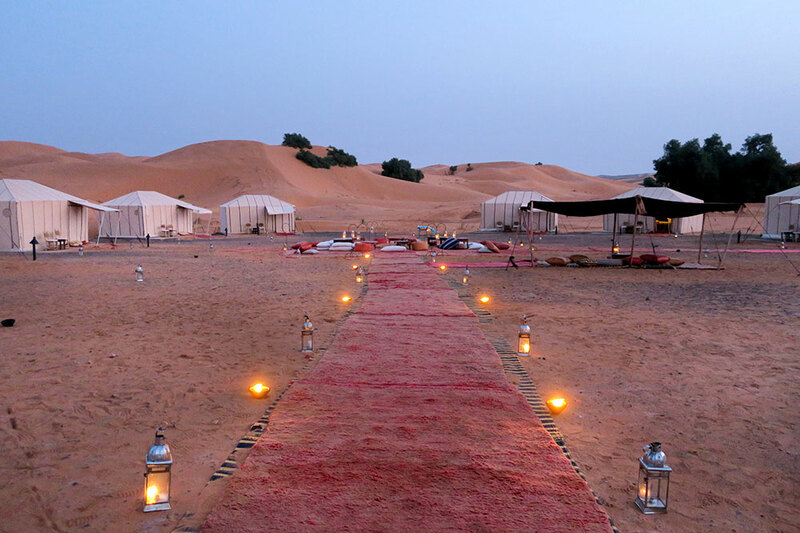 The beautiful setting in the dunes of the Sahara; the convivial atmosphere; the comfortable bed. The clumsy communication by the camp’s head office; our tent’s partially broken zipper, which allowed a cold wind inside. Book transfers through the camp rather than a tour operator or another hotel, because it can be difficult to find.